Hey, do you remember Blackberry? Remember how for years, every white-collar professional who worked in every office had to have one? And how they made consumer smartphones, that some people actually bought, and wanted to be all cool? When I started work at the headquarters for a major media company in 2008, every executive had one. They were tied to them. By the time I left that company less than four years later, those executives mostly had iPhones (and the ones who didn't had Android devices). That organization was not atypical. By this year, the company behind Blackberry has all but folded, facing one financial disaster after another. The company whose product once defined its entire class has fallen, lost under the waves of newer competitors who can do it sleeker and better. And even if the best, sleekest, fastest, most stylish Blackberry in the world were to hit store shelves tomorrow, it wouldn't matter. The tide of popular conception has turned on the Blackberry. To see one is to start thinking of dinosaur jokes. So why the parable about smartphones? Because I am beginning to worry that Microsoft, and Windows products, are in danger of pulling a Blackberry. Windows 8 doesn't need to kill Microsoft, and it doesn't need to kill PC gaming. But it sure seems to be trying its hardest to. The newest version of the world's most commonly-used operating system is set to launch on October 26. And so far, Microsoft has provided essentially no reason for anyone to upgrade. Instead, major PC developers have expressed very deep, very public concerns. One after the next, they worry. The head of Stardock has described the killer problems in the OS. Blizzard execs are not thrilled with where Windows is heading in the future. Notch, of Minecraft fame, has cautioned that as it stands, Windows 8 could be very bad for indie developers. And most famously, and infamously, Gabe Newell of Valve said that Windows 8 "is a catastrophe for everyone in the PC space." Valve is putting their money where their mouth is. Steam already offers Mac OS support, in addition to Windows. They will soon be expanding to Linux, as a way to continue to hedge their bets. And just today, Valve announced that Steam will be expanding its store and platform to include non-gaming software, "to range from creativity to productivity." "Productivity" is a byword for business and office tools, the one area where Microsoft has remained unquestionably dominant so far. If Steam becomes a viable platform to bridge games and other software across multiple operating systems, Microsoft may have a large problem on its hands. Meanwhile, the entire concept of the PC itself is coming under fire in the age of the rising tablet. For many of us, a keyboard is still not optional. Students and professionals need to be able to write, a lot, and 85+ wpm on a tablet just isn't the same. But where fifteen years ago every household aimed to have the family desktop, these days that same household is more likely to hold a scattering of portable devices. PC gaming finds itself in an excellent position at the moment, as the consoles with which it competes are showing their age. One solid desktop or even laptop is still the all-purpose device that can bridge the gap between console and phone. But the time of the PC, and especially the Windows PC, naturally dominating the landscape for all is ending. As the 21st century marches on, Microsoft will have to actively woo both consumers and developers into using Windows platforms. Making Windows 8 into a blockier and more colorful iOS, accompanying tablet and all, might help them in some ways while it hurts them in others. 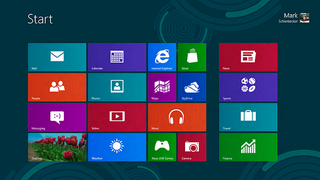 But now, whether or not Windows 8 is any good feels like something of a pointless question. The tide of public sentiment right now is against it. As of May, nearly half of users and companies were still holding on to Windows XP, and hadn't even jumped to 7. That giant percentage of the market probably isn't going to run out and buy upgrades in October. And the way Windows 8 looks at the moment, neither will I.
Microsoft stands poised right now to go one of two ways: either to continue their dominance, and in so doing to give customers some reason to choose their products, or to become another Blackberry. Personally, I really like assembling my own PC and I've never liked using any version of Mac OS, so I hope they don't do the latter. I'm just amazed that we've hit the point where Windows is something I feel the need to cheer on—and where I worry it might be an underdog.